Alex Chang's monthly BBQ event series kicks off on Sunday, February 21st from 2pm to 6pm and will continue every third Sunday of the month. Steve Santana of Taquiza will be in the "backyard" with Alex on the 21st and they will be doing the Mexican BBQ thing with dishes starting at $6. Upcoming confirmed chefs for ‘Alex Chang’s Backyard Cookout’ series include chef Brad Kilgore of Alter on March 20th and chef Phuket Thongsodchaveondee of Cake Thai on April 17th. 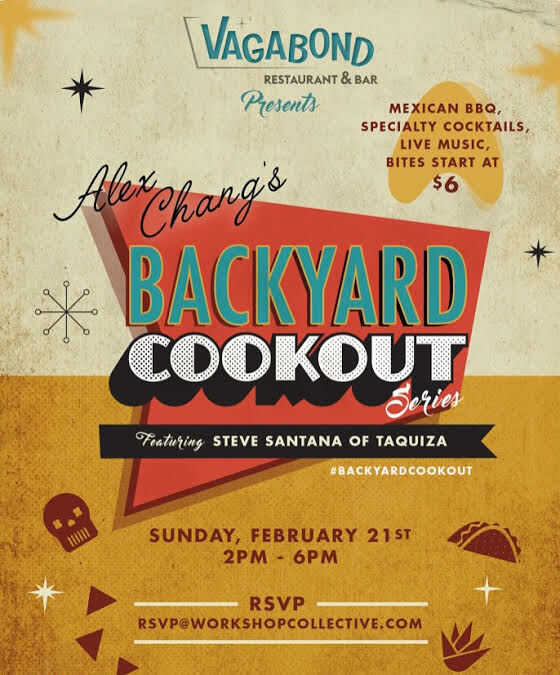 Admission is complimentary with RSVP via Eventbrite: Alex Chang's Backyard Cookout with Steve Santana of Taquiza. Vagabond Restaurant & Bar is located at 7301 Biscayne Boulevard, Miami, FL 33138.